Interestingly, Sakura uses the same setup for both Rayflower and Creature Creature. In interviews from this period, Sakura has changed his old attitude completely. Back in the "True" era, he said in an interview "I don't want people to be able to say 'This is Sakura's sound!'" and the results were that he changed gear all the time. However, he is now saying the opposite in interviews: "I want to use one setup for everything, and for people to say 'This is Sakura's sound!'" And this kit is the "sound" in question. Toms: Custom Pearl Masters 10"x8", 12"x8", 14"x12", 16"x12"
Bass drum: Custom Pearl Masters 22"x22"
These have been detailed nicely in magazines. Not much to add. Unfortunately I have no clue what the bass drum heads are. The batter head is either clear or ebony, but definitely not white. 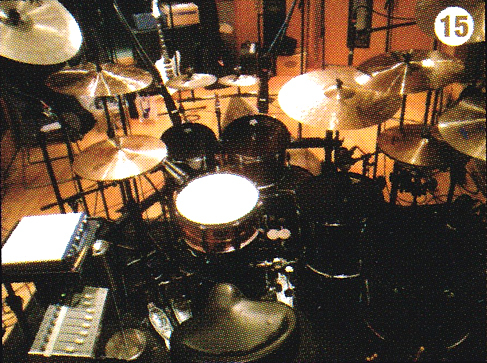 Cymbals, as we can see in the (unfortunately tiny) studio shots, are finally changing. He's added a Paiste Formula 602 crash for one thing. 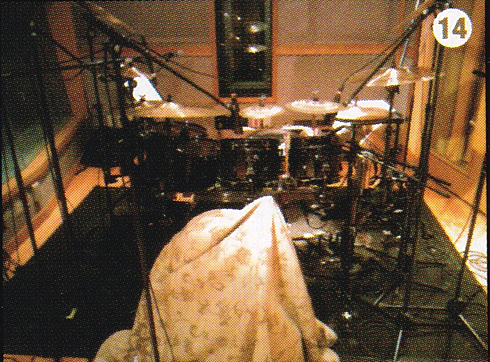 The ride in this picture still appears to be his 22" Paiste Signature ride but it is very difficult to say for sure. His main chinese is now a 19" Sabian Paragon, and his secondary chinese is the 18" HHX from SOAP. There are two sets of hi-hats, but I can't see at all what the auxiliary hats might be. Based on his aux hats on other albums, they too are 2002 Sound Edge hats, maybe in 14"?